Here are some process photos for making a painterly monotype with non-toxic inks from a sheet of acrylic or plexiglass. If you’re interested in diving a little deeper into printmaking and monotypes, I’ve got a series of monotype tutorial demos for you on my youtube channel here. Grab a beverage and a notebook. In each video on my channel, there is a list of supply links to everything used in the demo. Find the lists in the ‘Show More’ links under each video window. Be sure to subscribe to the channel so you don’t miss upcoming watercolor and printmaking tutorial videos. This is the color Graphite (by Akua Inks) on an 8×10, beveled plexiglass sheet. I’m applying a thin, even layer of the ink with a 4″ brayer. Printmaking like this can be done without a press. Dark field monotype = starting with a veil of ink, and working in a subtractive process. Above, I’m removing ink from the plate with paper blending stomps. I’m scraping linear elements into wet ink with a Clay Shaper. Pulling the monotype print after a trip through the press. You can see in the process photo above that the graphite colored ink resembles a drawing made with graphite powder. It’s a lovely gray color. There was just enough ink on the plate (you can see it above) to suggest an experimental ghost print. I rolled up my sleeves, threw caution to the wind and rifled my paper stash for more printmaking paper. But alas, I was out. Since when has a missing ingredient stopped a decent chef? No worries – I can improvise! I dunked and blotted a sheet of Strathmore Smooth Bristol paper. This paper is not recommended for water media – it’s a great pen & ink/drawing paper. I’m disclosing to you right here and now that I knew it wasn’t manufactured for wet media, but I wet it anyway, because every now and again, I am a printmaking daredevil. As you can see in the photo below, it printed okay, but….. Such a faint and barely discernible ghost print, but it’s enough to work as an underpainting, right? I think yes. This is where the not-meant-for-water-media Strathmore paper was wagging a finger of tsk-tsk at me, because the paper rippled (see above), and the watercolor pigments bled past the shapes where I laid them. (My dunk & blot step probably removed the surface sizing, which would make the paper handle watercolor like a paper towel. Lots of blooming.) But it’s okay, because this was a printmaking experiment from the start. I can change lanes in the studio, because I am Queen of the Rules in here. (So are you, by the way. Right?) After the watercolor dried, I had a lovely session with prismacolor colored pencils, cross-hatching and layering color with a great audiobook. Perseverance = All Fixed, resulting in the bird watcher at the top of this post. Moral of the story: 1) It’s okay to bend the rules in your studio and 2) fix your wonky watercolors with colored pencil. I’ll be having a limited-time Etsy-wide sale on all my work for Black Friday. Use the coupon code BlackFriday18 during checkout to get 20% off all the art in my Etsy Shop. The limited time sale begins this Friday, November 25th, and goes till midnight, Sunday, November 25th. Here’s a link to my Etsy Shop. If you have any questions related to combined shipping, or framing for unframed work, be in touch. I fill my inspiration barrel with a steady stream of artists’ blogs and studio newsletters. You can subscribe to most artists’ blogs to get new posts via email, and I highly recommend that you 1) take advantage of that by subscribing to your favorites and 2) make sure your own blog is set up for subscribing, especially if your posts are intermittent. When guests visit your site a few times, and they keep seeing just that single painting you posted last Spring, your audience will stop coming. If they’re subscribed, you get to push your new work out to them, instead of waiting for visitors. Capiche? What are you working on at your art table this week? Notice that I said the artists above are inspiring. There’s a big difference between being inspired by great art, and comparing your beginning drafts to a seasoned artist’s highlight reel. Be inspired by the great art around us, and relish in the access we all have to read studio missives from artists around the globe. Many fine artists share hard-earned wisdom in their posts. Read them, and use those nuggets of encouragement to fuel your own journey. The only art you should be comparing yours to is the stuff you did last week. Comparison should be reserved for measuring your progress against yourself. Don’t (ever) compare your art to masterworks – especially if you’ve just started, or life dictates that your art-making happens in fits and starts. Would you tell a toddler drawing tad poll figures that her work is awful? All beginners inch forward with practice and encouragement. There is no useful place in an artist’s journey for negative self talk, except maybe the trash bin. Have courage, be inspired and paint on. P.S. You’re invited to subscribe to this blog so you’ll get each post via email. Sign up here. P.P.S. If shipping your art gives you googley-eyes, this Bob Burridge video on shipping and packing artwork might help. Let me list for you some of the many ways in which you might be afraid to live a more creative life: You’re afraid you have no talent. You’re afraid you’ll be rejected or criticized or ridiculed or misunderstood or—worst of all—ignored. You’re afraid there’s no market for your creativity, and therefore no point in pursuing it. You’re afraid somebody else already did it better. You’re afraid everybody else already did it better. You’re afraid somebody will steal your ideas, so it’s safer to keep them hidden forever in the dark. You’re afraid you won’t be taken seriously. You’re afraid your work isn’t politically, emotionally, or artistically important enough to change anyone’s life. You’re afraid your dreams are embarrassing. You’re afraid that someday you’ll look back on your creative endeavors as having been a giant waste of time, effort, and money. You’re afraid you don’t have the right kind of discipline. You’re afraid you don’t have the right kind of work space, or financial freedom, or empty hours in which to focus on invention or exploration. You’re afraid you don’t have the right kind of training or degree. You’re afraid you’re too fat. (I don’t know what this has to do with creativity, exactly, but experience has taught me that most of us are afraid we’re too fat, so let’s just put that on the anxiety list, for good measure.) You’re afraid of being exposed as a hack, or a fool, or a dilettante, or a narcissist. You’re afraid of upsetting your family with what you may reveal. You’re afraid of what your peers and coworkers will say if you express your personal truth aloud. You’re afraid of unleashing your innermost demons, and you really don’t want to encounter your innermost demons. You’re afraid your best work is behind you. You’re afraid you never had any best work to begin with. You’re afraid you neglected your creativity for so long that now you can never get it back. You’re afraid you’re too old to start. You’re afraid you’re too young to start. You’re afraid because something went well in your life once, so obviously nothing can ever go well again. You’re afraid because nothing has ever gone well in your life, so why bother trying? You’re afraid of being a one-hit wonder. You’re afraid of being a no-hit wonder. 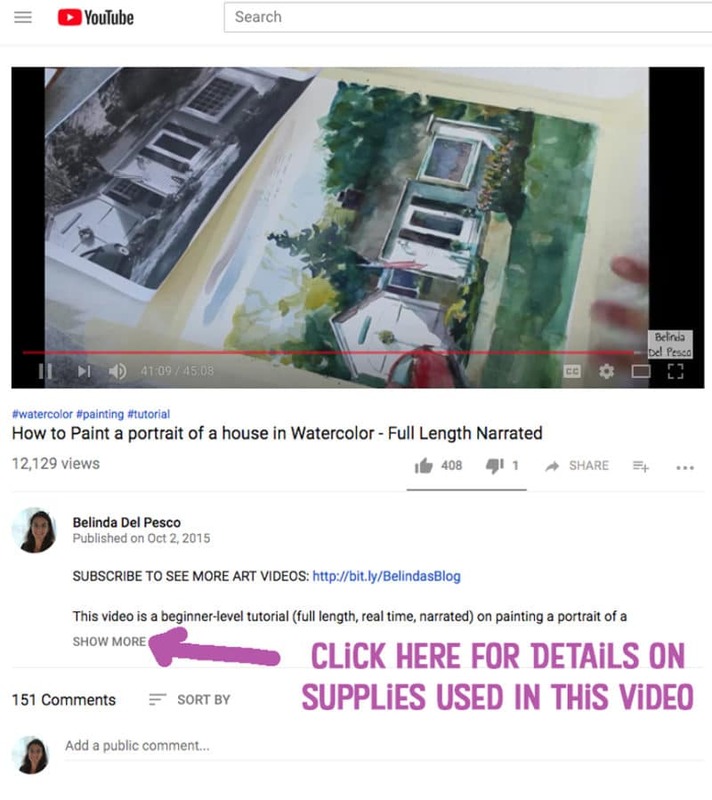 Need a little video course to get your art supplies in your hands more often? It’s free. Click the paint brushes…. Hello Belinda, I have enjoyed your art posts and have learned a lot. I have taken classes in printmaking and drawing but seem to fall short in the area of color work. Do you have a recommendation for a book on learning to use color? Hi Marilyn, Thanks for your compliments. I’m glad you’ve learned some things here. 🙂 Can you tell me a little more on how you’re struggling with color? Do you work in watercolor? Are you struggling with mixing colors? Or selecting them in your work? Give me an example on how you thought a color didn’t work for you in a painting. Belinda, you are welcome to quote my question. I’m pretty sure that I’ve done things backwards… For the last several years I have worked on improving my watercolor, with an occasional spurt of printmaking (chiefly, linocut, which I love). My art-making goal this year was to get over my fear of exposure and enter watercolor competitions. I’ve gotten into several competitions, thankfully. So, now, my goal for 2019 is to set up a website/blog. I’ve been thinking and planning, but the website is still in the works. I’ve put a few paintings on my personal Facebook page, but no website, yet. ; ) I think that you are right and that lots of people would like to know your thoughts on painting/print size. I look forward to that post!! Marie, Thanks for giving me permission to share parts of your question. Hopefully the answers make sense to you. For the record, your description of how you’ve done things sounds great. Nothing backwards about it. Keep painting, and keep applying to shows, and keep sharing your art on Facebook and social media. And if the notion of building a web site or a blog is overwhelming, hire someone so it’ll be done. That’ll free you to paint, and work on getting familiar with uploading and posting to your blog, and sending it out to subscribers. 🙂 You got this! I’d love to see a list of printmakers that you find inspiring! As always, I love your posts! And, I have a question for you… How have you decided on the size of your work? I have been trying to enter some watercolor competitions, mainly just to see if I will be accepted (and sometimes I have been and sometimes not, and that’s okay!). But, it seems that larger works are the norm. Why have you made the decision to go smaller with your work? Do you find that it sells better? Is it more fun for you because it’s quicker or more manageable? Do you sometimes do larger work (printmaking or watercolor)? I’d love to hear your thoughts on the size of your work! Thanks, Belinda! Love seeing the email that you’ve put up another post! On size, I’d like to answer the question in a post, because it’s interesting and there’s more than a few things to consider. Plus, I think other folks have this question too. Is it okay if I quote your question in a blog post? And if so, can I link back to your painting blog, or online presence? Thanks for being specific. Great idea, as I don’t know if I’ve ever thought to focus on monotypes from the artists I follow. I”d be glad to share. Be prepared to see lots of different types of art from each artist – they almost all do various printmaking and painting in addition to monotypes. I’d love a list a list of inspiring Printmakers!